It’s been over a week since the 2013 World Series of Poker Main Event began as a total of 6,352 players paid the $10,000 buy-in for the chance to be part of history. As the days went by, the glamorous tables at the Rio All-Suite Hotel and Casino became less crowded and with Day 6 now concluded, only 27 players remain. Day 7 will end once only one table remains and the November Nine members are set. The one that is now in the best position to make it to the final table is Anton Morgenstern from Germany since he is the chip leader with 21,955,000 chips. The road ahead will not be easy since there are still some big names in the tournament, including JC Tran who has won two WSOP bracelets throughout his career, Carlos Mortensen who was the Main Event champion in 2001 and bracelet winner Amir Lehavot, just to name a few. 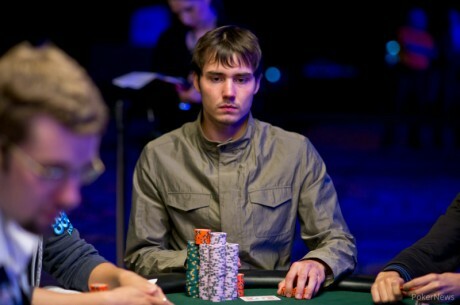 Steve Gee was the first one to be eliminated from the final table last year and is now holding 3,160,000 chips, going into day 7, while looking to become the first player to make back-to-back final tables in WSOP Main Events since Dan Harrington. Before we get into the action that took place on Day 6, it is important to point out that PokerStars has been rooting for Anton Morgenstern for several days now. On the blog of the online poker giant, Morgenstern is mentioned quite frequently as he is the one most likely to win the Main Event this year. For those that are not familiar with the biggest online poker room in the industry, this PokerStars review will offer all the information you need. According to PokerStars, the only thing that would stop Morgenstern would be some very bad luck but other than that, he is set on the winning path. After simply playing flawlessly throughout the event and not losing any chips since day 4, he came back on Monday to increase his stack even more and force people to take notice of this PokerStars Main Event Passport winner. The card room is frequently holding online satellites for the big tournaments across the world, known as the Main Event Passport. The winner can choose which events he wants to join with the Passport, be it in the WSOP or in the PCA. Try PokerStars for free HERE! When Day 6 started, 68 players took their seats and most of them were expecting for some tight plays from their opponents in order to extend their run as much as possible. However, on the very first hand of the day, Noah Schwartz goes all-in with Kings only to come across the Aces held by Jay Farber. Shortly after that, Tyler Cornell was the first one of the day to be sent to the rails as his Jacks met Queens. He got a $102,102 payday for his 68th place finish. Other players then followed him away from the tables as the field kept getting smaller and smaller. A fan favorite, Brett Richey, was eliminated during Level 27 by James Alexander when the latter raised from middle position and the action then folded to Richey. He pushed all-in and Alexander called instantly to show pocket Aces against Richey’s K-Q offsuit. The board ran J-high and Richey was out in 55th place. By the time the dinner break came along, only 37 players remained and the chip leader from the start of the day was not one of them. Sami Rustom finished in 39th place and won $185,694. Jackie Glazier was the last woman standing in the 2013 WSOP Main Event and she was eliminated in 31st place. The Australian pushed her remaining stack of just shy of 2 million chips from the big blind while holding A-Q of spades. She got called by Sergio Castelluccio whose pocket Tens held up and only men remained in the tournament. After George Wong was eliminated in 28th place, play was stopped for the night. The action will resume on Monday in order to determine who will come back in November to play for the highly coveted trophy and the title of 2013 WSOP Champion!